I am extremely tired, and need to post about the last couple of days. I am now back in the UK, and yesterday I had a massive day. It started at 4am, and ended…. well it hasn’t ended yet. It involved a road race and a narrowly missed crash (will post about as soon as the images are made available), a 12 hour flight and now I am back in the UK sat at my desk. It is surreal at times that places are so near, and yet so far. The flight to Cape Town is only the aforementioned 12 hours, and that is nothing. It is so close, and at the same time, that is a massive distance. In Cape Town yesterday it was 30 degrees in the afternoon. Landing at Heathrow, and returning to home brought reality to me. On a side note, has anyone seen the film ‘Stay’? Can you explain it to me? Perhaps I was over tired, but was he in fact projecting everything onto other people? hmmm….. Whatever, I didn’t really like it! I would like to write an entry for today. I would like to write something about South Africa that sums up my experience here, my feelings for the place, the reason why I am ready to leave, and the reason why I feel at some point that I must return. I don’t usually get involved with my holiday plans. I mean, I usually leave it to The Pretty One to organise everything. It is lazy of me, and I don’t excuse it. I also feel that I should be more proactive about where I go. I fly in and out of places and I am a stranger. I perhaps read a guide book, but my history is sadly lacking. My history and my geography. It is ignorance on my part, that I need to address. I excuse it by hiding behind the vale of business travel, but it is shameful. In South Africa I have visited places which I heard about as a child. Places that perhaps I never thought I would visit. It was a country that wasn’t on my radar, and probably would have remained off it, were it not for my best friend being here. But South Africa is a wonderful country, with wonderful people. It is a contradiction. It is Africa, but not Africa. Soft Africa for me. I intend to return both here, and to the continent. Leaving, I will take some new friendships with me. People who I hope to be able to stimulate and hope will be stimulated by me in the future. People with a different perspective, but one I now truly value. A South African friend who has experiences and an intellect that astounds me, and has perhaps seen more of the real world growing up here and in her time in the UK, having to swallow at times any sort of national pride, as well as her language to prevent her being a target of bigots putting everyone in the same boat. It is more real than I can ever hope to learn from my well meaning visits to historical tourist traps. I will write about these at a later date, because I am sure of their value, but I know, in my heart of hearts that a lot of it is appeasing the feeling of ‘needing’ to have a ‘real’ experience in the country. It is about ticking that box and moving on. In Cape Town, you have to go to the top of Table Mountain. In Cape Town you must go to Robben Island. I suppose a holiday is a holiday, but as intelligent people, perhaps we should challenge ourselves more than we do. Small bite-sized chunks of history, zoo type tours of less privileged areas is a disservice to yourself, those involved and history itself. Today was the first day on the bike since the trip to Cape Point. I had climbed Table Mountain in the meantime, and this had given me majorly achey legs. This had been bugging me the last couple of days, and I knew that I had to get back on the bike and sort it out. The problem was though, that I knew that this was going to be far from fun. We set off this morning, and my head was not in it at all. It was one of those rides where you know you need to ride, to pull yourself back into it. I was riding against myself, with no real want to do anything rather than complete what I had set out to do. Alex, on the other hand. Well today he flew. Good legs, and perhaps spurred by my (perhaps obvious) reluctance. He dropped me. Not once, but twice. On a day when I just wanted to get it over with, finding the will power to muster the energy to chase someone down didn’t come easy. In fact, by the time I had resolved to chase him, it was energy wasted, he was too far out. Good on him I say. It will be remembered. 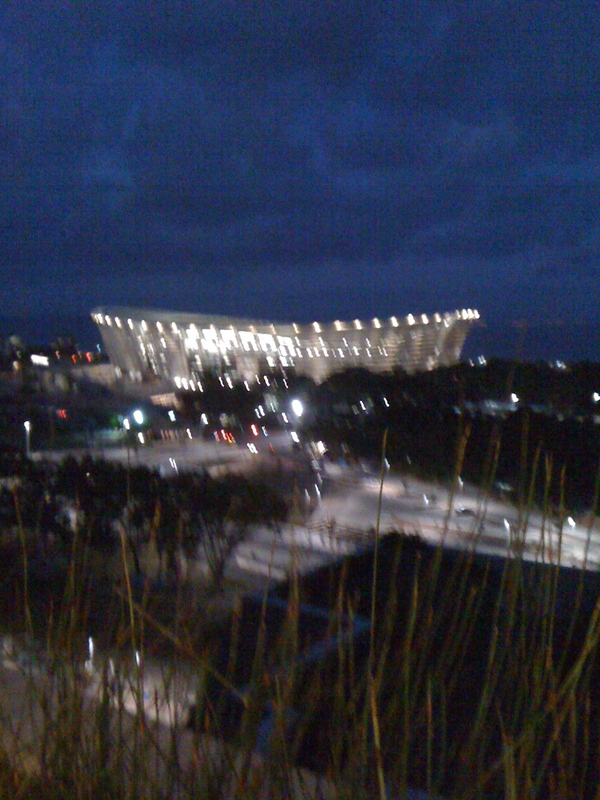 Last night we were invited to a Bloomberg party on the roof of an hotel here in Cape Town. Why were we invited? Because our friend from university (who I have met just once since leaving uni, and he lives in London!) was in town. He is responsible for or is part of the Africa sales team. We had lunch, then partied on the roof of a hotel with a bunch of suits. God, I felt like such an impostor! Good views though. Not blogged for the last two days, because I haven’t ridden. That and that we haven’t had an internet connection. In fact, I haven’t touched the bike. The first reason was that we thought it would be best to have a rest day. Rest day is a strange term, because actually having a lazy day was never going to be on the cards. What was on the cards was climbing Table Mountain on foot. For anyone who has done this, you’ll know it is far from a walk in the (national) park, and that it is almost hands and knees climbing at a couple of points. Our time to make it to the top was pretty good. A descent pace helped us completely. At the top, the view was great, but I suppose spoilt somewhat by the way that is has been (tastefully) made easily accessible for all by the cable car. The time that I most enjoyed was the climbing and descending of the path. Fewer people, and it seriously got the heart rate going, with perhaps the way down being more strenuous than the way up. Certainly it was harder on the legs. Yesterday I extended the tourist mission by travelling to Harmanus to see the whales there. It is one of the only places worldwide where one can see whales from the shore. It was a successful mission, not only with the whales, but with dolphins also showing up. It was an awesome day. Truly. I am still chilled in a major way from seeing these majestic animals. I am so glad that The Pretty One recommended that I go there, I am also very grateful to the friend who came with me on the day’s mission. Today was the ride that I had been looking forward to. The marvelous thing about having a bike on holiday is being able to do the normal tourist things, but not being one of those people to sit on a tour bus all day. Or in a car for that matter. What was especially great about this ride, is the fact that Alex only got into riding last year. He bought a bike from me (which he destroyed, but that is a different story) and it got him hooked. He now trains more than I do, and although I fared better than him throughout the ride today, that is only to do with muscle memory, and the fact that I have been doing this for years and years. I also think there is a small element of fear too, when you go farther than you have before. It wasn’t far off twice his previous max distance. Towards the end of the ride the recovery that I have managed to build up throughout the years was apparent, as I was able to pull away on the climbs, recover and tuck in again. What is true though is that his performance was impressive, and by March, when he leaves here, I am sure he will kick my arse on the bike. I don’t think I will be able to train this much throughout the European winter. The ride, and the scenery and being at the point of two oceans meet was a great experience. Riding through the Cape Point National Park is almost like riding through a lunar landscape, well, okay, there is vegetation, and the sea, but a little imagination is all it takes. Oh, and then there were baboons. There are also quite a lot of warning signs saying how aggressive they can be and to keep your distance. I think we were safe though. Lycra is scary whatever! Today was almost a write off. Last night involved lots of rum, and some fantastic conversation and something I really enjoy doing. I got to talk emotions with people. It might be to do with drunkenness, but I felt that there were some real connections made. Today we went to a market in the morning. It was one of those ‘farmers’ type markets, for the middle classes. I am sure you know the sort. Anyway, had some great food, and took some more pictures. Tomorrow is a long ride if the wind holds off. Camera will be coming with.